President Trump recently announced new tariffs on imports of steel and aluminum, in a move that got mixed reviews from business and political leaders. The new tariffs would increase levies on aluminum by 10 percent and steel by 25 percent. 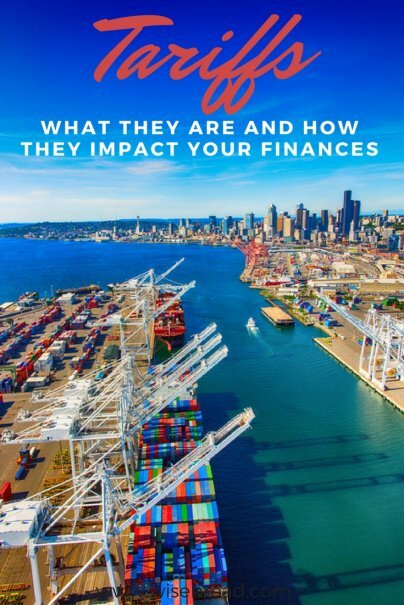 There is much debate about the sensibility of these tariffs, but rather than wade into that morass, let's examine what tariffs are and how they impact the economy and your investments. A tariff is essentially a tax that the government places on imported items. For example, the government may choose to place a tax on foreign cars or imported cotton. There are tariffs placed on an eye-popping number of products, from building materials and vegetables, to chemicals and even live animals. Tariffs can be imposed on a per-item basis, by weight or size, or by percentage of value. Tariffs can even vary depending on the country. For example, the U.S. may impose a tariff on shirts made in China, but not in Vietnam. The United States imposes tariffs on imports from many countries, but also has free trade agreements with many nations that allow both parties to import goods without tariffs. The first tariffs in the United States came shortly after the nation ratified the Constitution, and were motivated largely by the government's need for revenue. Tariffs played a big role in funding the government in the days before income taxes. Tariffs today still produce billions in revenue for the government, but they are also designed to help protect U.S.-based industries and companies. In essence, tariffs imposed on imported goods make those goods more expensive, thus giving a competitive advantage to American firms. But opponents of tariffs say they can hurt international trade and ultimately lead to lower economic growth worldwide. How does a tariff impact prices? Tariffs impact the cost of many of the products we buy. Just look at the label on the shirt you're wearing or your child's toy. Even if a product is manufactured or assembled in the United States, it may be made with materials that were produced overseas. Given that there are levies placed on thousands of imported goods, it's almost impossible to hold a product that isn't made more expensive by tariffs. The specific impact on price varies, however. Some tariffs are relatively small and are barely noticed by consumers. Even significant tariffs may not impact the cost of an individual item by very much. (One analysis said the cost of a can of Campbell's soup may go up less than one cent as a result of Trump's higher tariff on steel.) At various times in history, however, tariffs have led to problematic increases in prices. For example, tariffs on agricultural imports during the Great Depression, which were designed to support American farmers, led to higher food prices at a time when people were struggling financially. What industries are impacted by tariffs? Nearly every business is impacted by tariffs to some extent, either directly or indirectly. A tariff on steel, for example, will impact the steel industry overseas but in turn could make costs higher for American construction companies that use steel. Similarly, a tariff on aluminum could mean higher costs for the beer industry because its beverages are sold in aluminum cans. The U.S. has placed relatively high tariffs on clothing manufactured overseas, while electronics have tariffs that are much lower. How does this impact my investments? While tariffs are designed to protect and bolster U.S. industries, the actual impact on a company's bottom line — and investors — is not easy to predict. Consider the auto industry. There have long been tariffs on imported cars and automotive parts, but foreign car companies including Toyota and Honda have still recorded high sales while the U.S. auto industry has gone through struggles. After President Trump's announcement regarding steel and aluminum tariffs, the S&P 500 dropped more than 1.3 percent. But analysts have downplayed any fear of a broader economic downturn, suggesting that companies and the national economy are too large for it to be impacted by any one tariff. Moreover, since many investors have diverse portfolios, the impacts may even out, as some companies may benefit from tariffs while others might see negative impacts. "It usually takes more than cost pressures in one or two sectors to cause a recession," Fisher Investments wrote regarding the recent tariff order. "We don't mean to dismiss the personal impact any of this can have on workers and small business owners, but markets are callous, and at times like this, we think investors are best off thinking like markets."